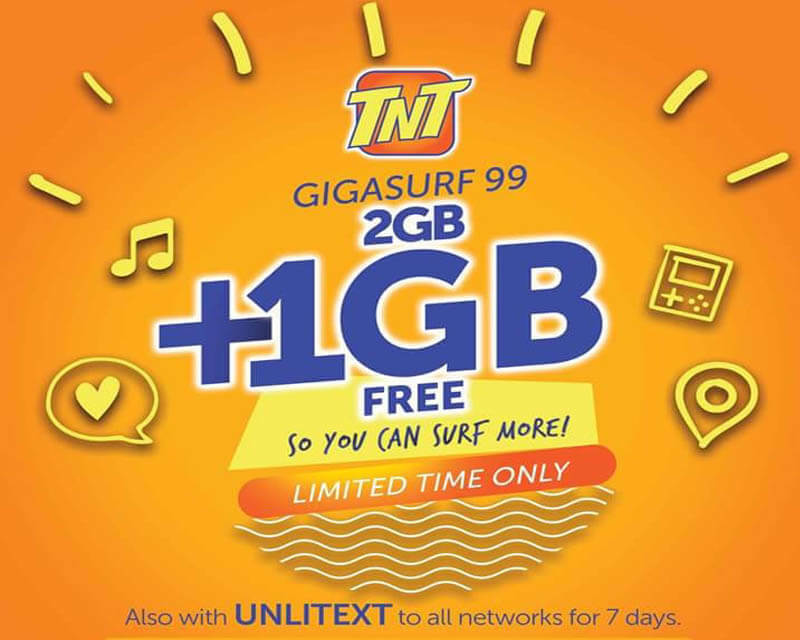 One of the best-selling surf promo is now available to Talk N Text (TNT) prepaid subscribers. You can now subscribe to the new GIGA99 or GigaSurf 99 promo that lets you enjoy up to 7 days surfing and texting for only 99 pesos. You have 3GB of data (limited time offer) that you can use to access the internet with your social media apps, browse webpage, download files, stream videos and more. It also includes unlimited text to all networks for 7 days that you can use to contact your friends and love ones without worrying what SIM card they are using. To subscribe, you are required to reload your prepaid account with at least Php99.00. Use the SMS keyword format below for reference. Just text GIGA99 send to 4545. 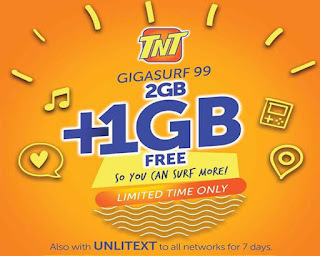 Text Unli text to all networks (not available) try new TNT SURFSAYA Promo. Also available in TNT GIGA50 – 3 days with 1GB data, 300MB for YouTube and unlitext to all networks. The good thing with this offer is that you are allowed to have multiple or concurrent registration. With that, you subscription expiration will be extended also. Wait for the SMS notification from TNT before you start using this internet promo and make sure you have strong cellular signal reception to avoid slow browsing speed.